Posted on September 28, 2010 by Jill B. Cue the Mission Impossible theme song and enter BlackJack USB drive—cyber security and government intelligence has a new partner when it comes to covert computer forensics. The BlackJack thumb drive is the brainchild of the Harris Corporation, a multibillion dollar communications and information technology company that supports U.S intelligence and military missions. The BlackJack is a custom USB drive that can securely partition and analyze computer or laptop search results through an instant scan and copy process. The search criteria are customized by the drive’s user for the specific task at hand using a Windows application and categorized for its importance to the mission. Green and red LED lights on the surface of the hardy, black USB thumb drive will immediately indicate whether or not the specific type of data it’s directed to find has been located. However, the primary feature that makes this thumb drive so appealing to its target market is its spy-like capability to leave no digital footprint behind. Coupled with a fast three-second boot up time, BlackJack allows a user to get quickly in and out of stealth situations. 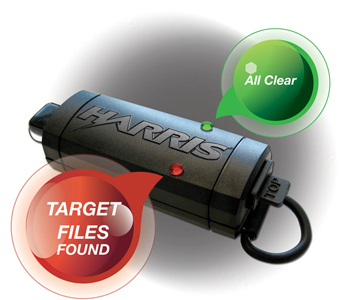 For military and intelligence operations, or gathering sensitive legal evidence, the Harris BlackJack USB drive acts like a user’s own personal espionage partner; a device fit for James Bond or Jason Bourne. The thumb drive’s applications could also easily translate into other corporate or private sectors. Question is, if this same flash drive technology became common in the consumer market, would it be a good or bad thing? On one hand, it could lead to the everyday user of a BlackJack-type drive abusing the kind of information they could gather without a trace. On the other hand, the partitioning and speed of searching for specific data could help in getting the right information faster to individuals for their work or school applications. Are you impressed with the Harris BlackJack’s ability to take search results and prioritize them without a digital trace left behind? Feel free to comment! This entry was posted in Articles, Flash Drive, Harris Corporation, Preloaded USB, USB Flash Drives and tagged BlackJack Cyber Security USB, BlackJack thumb drive, BlackJack USB, BlackJack USB Flash Drives, Custom Thumb Drives, Custom USB Drive, Cyber Security USB Drive, Harris Corporation. Bookmark the permalink.